It's been raining for days. I just recently saw the first yellow leaf fall from a tree. Summer is officially over, and inevitable as it is, it's always a bit of a shock. This realisation made me look back at this year and well, it must be said that musically speaking it hasn't been a spectacular one. Fortunately we're only halfway there and there are a lot of promising albums to be released during the latter half of the year. 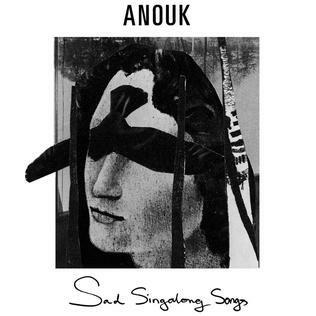 Also, though the year has generally given little to write home about, there have been some pearls along the way and one of the most brilliant ones is Anouk's Sad Singalong Songs which makes a perfect soundtrack for your autumn. Anouk received massive international exposure due to her participance in the Eurovision Song Contest with "Birds", the lead single off the album. More than your average ESC participant, she's hardly a one-hit-wonder considering she's been around since 1997. Sad Singalong Songs marked a noticeable departure from her previous alt-rock style, and reminds me of PJ Harvey's Let England Shake in the sense that both are female rock singers initially known for their edgier approach before writing a mind-blowing "mellow album". Though neither of the two albums are exactly easy listening: Let England Shake is essentially an album about war whereas Sad Singalong Songs is a collection of not-necessarily-so-happy love stories. The album kicks off with the dramatic opener "The Rules", which has Anouk counting different kinds of rules, a bit like Marina & the Diamonds in "How To Be A Heartbreaker" but also nothing like Marina & the Diamonds in "How To Be A Heartbreaker". Backed with a choir, she sounds like an angel descending from heavens above declaring the rules of life. You'd better believe her. The song segues into the wistful "Pretending As Always", which is actually even better than her Eurovision entry "Birds", the next song on the album. The former also has one of the best choruses on the album, with the singer reminiscing an old flame: "In my dreams I'll make you want me / One more time the sun will shine / 'cause they won't love you like I love you / You still make me cry". It's all very relatable for all of us, I believe. The latter is one you've likely heard before due to her Eurovision appearance, but it's a stunning waltz nevertheless with meaningful lyrics to boot, such as the following line: "If being myself is what I do wrong / Then I would rather not be right". Then things turn gloomier with the tragic "Good Life", followed by "Are You Lonely", which features an intro that could be a funeral march, and "Stardust", which has a hopeful chorus despite its otherwise murky sound. Anouk shows her more playful sound in the next two tracks, "Only A Mother" and "Kill". The first one is less of a love song but a song about motherhood (as the title might suggest). "Kill" opens with witty lines "Don't kill that man, don't kill that man / He could be the one that brings you gifts for Christmas" before turning into a darker affair. The penultimate track, "I Don't Know Nothing" is a beautiful ballad that finally fades into the album closer "The Black Side Of My Mind". The record is rather melancholic in sound, but the aforementioned song ends the album on a high note with lyrics such as "The black side of my mind is getting weaker / The black side of my soul is getting white". The song sees a person letting finally go of her sorrow and achieving closure, while serving as a climatic ending for the album before finally spiralling off into the ether. The album makes a full circle - "The Rules" begins with train sounds, and "The Black Side Of My Mind" features train sounds as well during its ending. Life might be a journey through heartbreaks and tragedy but if Anouk is to be believed, it can also be a stunningly beautiful one. For the full Anouk experience, you should also check out the accompanying music videos. They're all linked in some way and feature Anouk in a cameo role. Good luck spotting all the links and her appearances!